The e.cam® Signature Series has earned an enviable reputation for outstanding image quality and clinical flexibility. Siemens sets the standard of excellence with outstanding performance, styling and options. e.cam Signature Series improves your clinical performance and the patient’s experience every step of the way. The Signature Series features subdued color accents, creating a more open and calm environment. 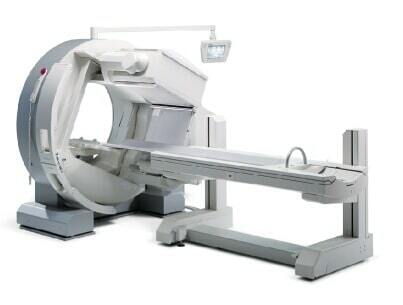 HD detectors with high count rate and energy independent performance ensure outstanding image quality. Our exclusive e.media option is the first-ever patient comfort and clinical education system, providing on-board interactive multi-media capability. Flash 3D, the most advanced SPECT iterative reconstruction technology available lets you optimize acquisition time and image quality. User-defined workflows improve department efficiency and throughput. Syngo MI Workplace offers increased speed, capacity, and performance. Broad DICOM connectivity allows viewing of multi-modality images side-by-side with nuclear medicine images.